The Sparkle Peeping Caddis is based on Hans van Kilinken's Leadhead Nymph. It is best fished dead drift style bouncing along the bottom with the head wiggling temptingly. Body : Strand of cream or white sparkle yarn, melted at tail end and tied in over bend of hook. Hackle : Grey partridge, wound at bend. 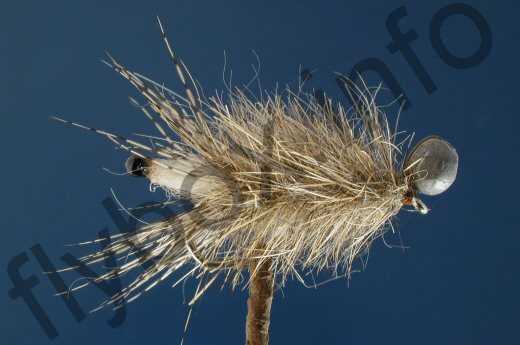 Body : Hares's fur and UV dubbing, spun in a dubbing loop. Head: Split shot to suit on a loop of mono. Currently there are no comments about the Sparkle Peeping Caddis fly pattern from other fly fishermen yet.